Who is deadpool? 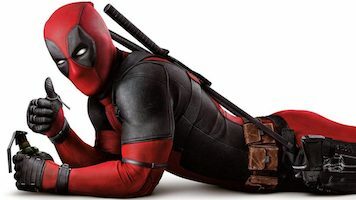 What is deadpool? Deadpool is a bet. Who is going to end up dead first! Deadpool always came back. He hung in a bar with badass superhereos and there was a pool on who would die next, the deadpool. Deadpool is also a Canadian superhero. Or at least played by a Canadian. That means he is a polite superhereo, sorry to kill you, he would say. Dressing up as deadpool means you are the anti super hero. You can have fun, be polite and be a super hero, be deadpool. Have fun being bad, it’s great being the bad and quirky superhero. 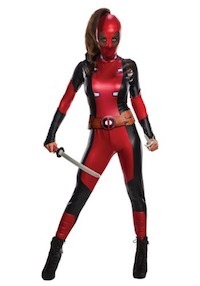 Click here to see more Deadpool costumes. Find Deadpool costume ideas for adults, kids and pets below. 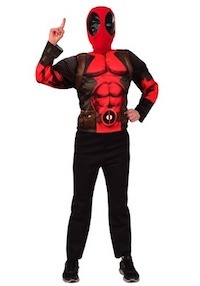 This officially licensed Deadpool costume comes with everything you need (aside from mutant powers) to become the Merc with a Mouth. 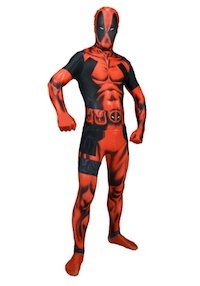 The jumpsuit is bright red, which Deadpool uses to hide his wounds during a battle, but you can use to stand out at any convention or costume party. The black accents along the sides accurately recreate his look from the X-Force comic books. The gauntlets have black faux leather accents and the matching boot tops fit perfectly with any pair of black boot covers you might have. The belt even includes Deadpool’s symbol on the front. This costume also comes with 2 masks. One, which is Deadpool’s standard red and black mask, and the second mask, which recreates Deadpool’s scarred face. You can wear either one to feel like the deadly Marvel mutant. 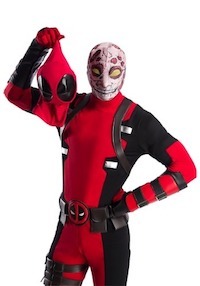 Click here to get Marvel Deadpool Morph Costume. he sleek jumpsuit has a form fitting look that’s easy to move in, but also conveys your break-the-rules kind of attitude when it comes to crime fighting. Make your super pup a superpowered pupper with this Deadpool Pet Costume. The comfy coat will keep them warm and also give them the look of the crazy comic character, himself. The coat is styled after the black and red armor of the regenerating menace and even includes two little swords that are going to flail all over whenever your pet runs around! 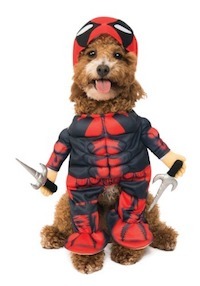 Click here to get the Deadpool Costumes for Dogs. This sweet suit tells the world that you’ve got some special skills, even if those skills are limited to reciting all of the hilarious one-liners. You’ll have a great time in the flexible suit, it’s easy to put on with a zipper at the back. The costume also comes with a hooded mask and soft, comfortable belt. You’ve got to have a costume from head to toe and, today, we’re going to focus on the toes. Your costume is near perfect, but you need a little bit of that dazzle for your superfeet. 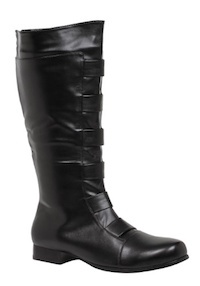 Do so with these Adult Black Superhero Boots. 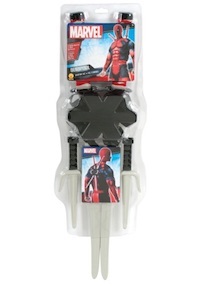 This Deadpool Weapon Kit DOES come with some pretty cool and lethal toy weapons you can use to subdue your foes, along with a backpack with slots for each weapon. 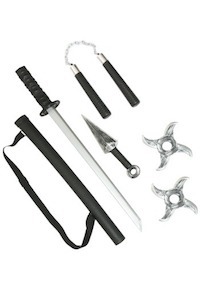 Click here to get Deadpool Weapon Kit. These are Marvel Deadpool Tights. 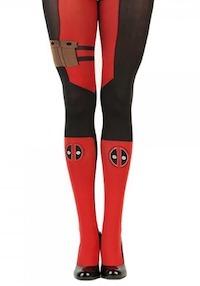 Keep your legs warm and look like Deadpool at the same time. As you can see, Deadpool has 2 swords that he sometimes uses if he thinks you are a worth opponent. He is a little cocky so you might end up half dead or alive and missing a finger or two or a hand. He doesn’t care, just as long as you’re not chasing him anymore but more often than not, he’ll kill you with these rubber swords. 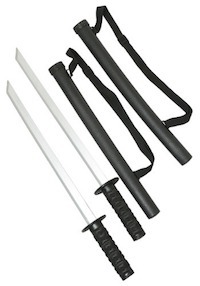 Click here to get Deadpool Weapon Set. No, Deadpool does not stop being Deadpool, not even to go to bed. 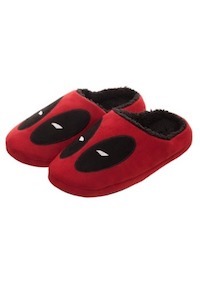 Deadpool probably wears his suit to bed too, so you should as well but keep your feet warm with these Deadpool slippers. 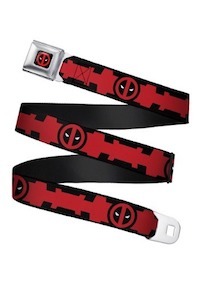 Click here to get Deadpool Utility Belt. Deadpool comes fully prepared with any weapon and every weapon that he can hide on his body. All these weapon accessories can fit on your utility belt and you should keep them on you at all times. 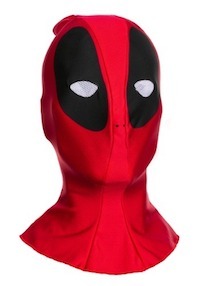 This Deadpool Adult Fabric Overhead Mask combines the stealthy nature of a ninja mask with flashy red colors. It has white mesh covering the eye holes and the iconic Deadpool design. Click here to get Deadpool Mask.